Epoxy Encapsulated Transformers are used in harsh operating environments to withstand corrosive atmospheres, hazardous gases, dust and moisture. Given their mechanical ruggedness and electrical and thermal characteristics, encapsulated transformers can be used for a wide range of challenging applications in petrochemical plants, mines, marine and shipboard installation. 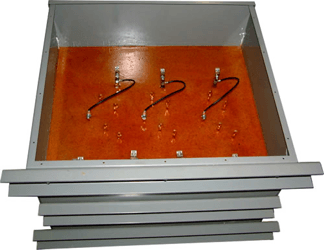 Epoxy encapsulated transformer enclosures are usually rated Nema-3R or Nema-4 and they provide reliable protection from corrosive atmospheres, hazardous gases, dust and moisture. Epoxy encapsulating is a process in which a transformer is completely sealed with epoxy resin. This process is normally preferred when a unit might encounter harsh environmental conditions. Epoxy encapsulated transformers are usually a mixture of silica sand resin which form a solid mass completely enclosing and protecting the core and coil, also significantly reducing audible noise. The enclosure is constructed from heavy gauge steel. These transformers offer a number of advantages over traditional open-core designs. The most obvious benefits arise from the physical protection that the encapsulate and the outer casing provide to the windings, core, and lead connections. With these fragile components sealed inside a tough, waterproof casing, encapsulated transformers are a clear choice whenever moisture, dust, dirt, or other environmental threats are an issue. Encapsulation also has a strong impact on thermal and electrical performance. The epoxy compound used for potting has a high coefficient-of-thermal conductivity and is very effective at dissipating heat away from the windings and the core. This thermal management reduces winding temperature differentials and allows the transformers to be used in higher ambient temperature environments without exceeding allowable temperatures for the insulation class. The manufacturing process for encapsulated power transformers is closely controlled for quality and consistency. Potting is done under vacuum. All products are thoroughly tested at each stage and are designed to meet a wide range of Canadian, US and international standards.